Although the coastline of Trinidad is what attracts such large numbers of visitors to the island each year, tourists are often delighted to find so many intriguing sights, historical landmarks and imposing monuments, both old and new. The Port of Spain, Trinidad's capital, is home to no less than two stunning religious landmarks, the Cathedral of the Immaculate Conception and the Holy Trinity Cathedral, as well as countless other sights. 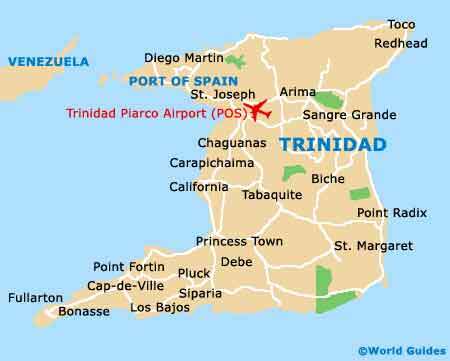 Also in Port of Spain are a number of other very important Trinidad landmarks, such as the Archbishop's House, the Brian Lara Promenade, Fort George, the Hall of Justice and the President's House. 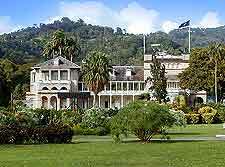 Located on the northerly outskirts of Port of Spain and directly across from the Queen's Park Savannah, Trinidad's famous President's House was once the home of Governor Ralph Woodford some 200 years ago and part of a vast sugar plantation. However, in the early 1870s, the original building was rebuilt with very traditional and ornate Victorian architecture, typical of that era. 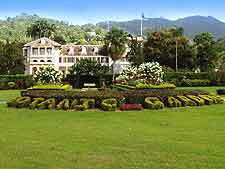 Today the palace stands alongside the island's beautiful Botanical Gardens and now serves as the official and private residence of the President of the Republic of Trinidad and Tobago. Many awards ceremonies, receptions and events are staged here each year. 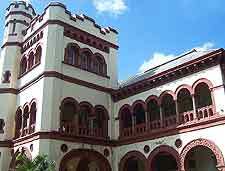 The Archbishop's House serves as the home of Trinidad and Tobago's very esteemed Roman Catholic Archbishop of the Diocese and stands in Port of Spain, across from the Queen's Park Savannah. An especially beautiful landmark, the Archbishop's House is actually part of a group of historical buildings named the 'Magnificent Seven'. Ever since it was completed in 1904, the country's archbishops have occupied this building. 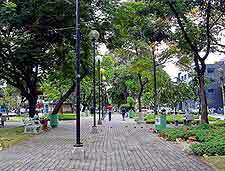 The brick-paved Brian Lara Promenade is a relatively recent addition to the landscape of Port of Spain and after many years of planning, was created in the 1990s and currently connects the Cathedral of the Immaculate Conception with the Cipriani Statue. Reclaiming land next to the waterfront, the Brian Lara Promenade is part of the Independence Square (formerly known as the Plaza de la Marina) and named after Trinidad's much-loved cricketer, Brian Lara, who once clocked up no less than 400 runs in a past test match. A number of cafes, bars and banks are conveniently close by, including the Eric Williams Financial Complex. Sited in San Fernando and named after the American businessman and philanthropist Andrew Carnegie (1835 to 1919), who first funded the building of this public library in 1911. Built using the latest techniques and materials, including concrete, the Carnegie Free Library finally opened its door in 1919 and has become an integral part of the local community ever since. Many book-related events take place here each year, often being highly suitable for children. Trinidad's famous Roman Cathedral is certainly amongst its most imposing landmarks and dominates the Independence Square in Port of Spain. The Cathedral of the Immaculate Conception boasts a matching pair of towers and holds regular masses each day, where all are made to feel welcome. 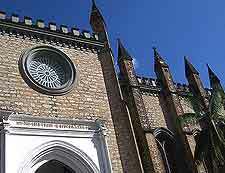 Dating back to the 1820s, this cathedral is known for its distinctive peach facade and pentagonal altar. Construction of the magnificent Holy Trinity Cathedral began in the 1820s, although sadly just under 100 years later, much of the Holy Trinity Cathedral was completely destroyed by fire. In 1916, rebuilding of this cathedral commenced and was followed by consecration just seven years later. Today, the cathedral remains in a good state of repair and very much resembles its predecessor. 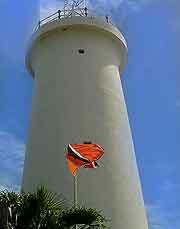 Dating from the very end of the 19th century, the Galera Lighthouse stands next to the village of Toco and on the far north-easterly side of Trinidad, at the point where both the Atlantic Ocean and the Caribbean Sea converge. Over the years, the Galera Lighthouse has become such as popular landmark that a Family Park has been developed around the base, making the most of the special natural scenery and views. Built at the very beginning of the 19th century, Fort George is now more than 200 years old and presides high above Port of Spain, where its imposing facade is certainly easy to spot. The fortress provided an important vantage point and was used to protect the city against possible invasion, while also being a secure storage facility for some priceless treasures and artefacts. Tourists often come here for the grounds alone, which are perfect for relaxing and an impromptu picnic. 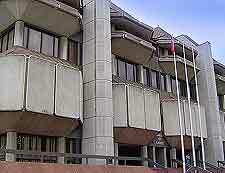 Situated within the very heart of Port of Spain and standing close to the Red House, the Hall of Justice has been owned by the Trinidad government since the 1980s and is where you will find the High Court. This is a modern and rather stylish landmark, with understated architecture and two large stone columns, which stand either side of the entrance staircase and stretch to the very top of the building. 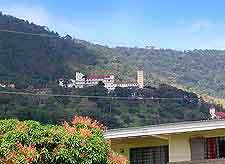 Mount Saint Benedict dates back roughly 100 years and is not only the most historic Benedictine monastery in Trinidad, but in the whole of the Caribbean. 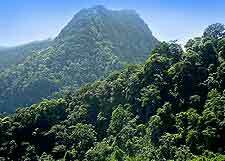 Standing high above the surrounding plains and easily visible from the Eastern Main Road, the Mount Saint Benedict is situated within St. Augustine, close to Arima and is actually part of the Northern Range. Afternoon tea is always a popular attraction at the monastery, featuring freshly baked bread and cakes. The Northern Range is without question one of the island's most impressive of all its natural landmarks and comprises the highest mountains on the island, the Tucuche and also the Cerro del Aripo. Although reaching the mountain summits is a fair old trek, any effort is more than rewarded by the uninterrupted views and plentiful wildlife. Many tourists choose to visit the Aripo Caves in particular, which feature underground caverns stretching almost 100 metres / 328 feet in total.